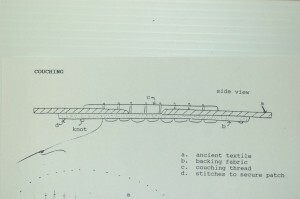 When patching a textile artifact to fill a hole, reinforce a weak area or consolidate unravelling yarns, couching is the technique of choice. We want to hold the patch to the artifact securely but with a minimum number of punctures by the needle. And, reversibility being an important principle of conservation, we want to be able to remove the patch without risk to the artifact. 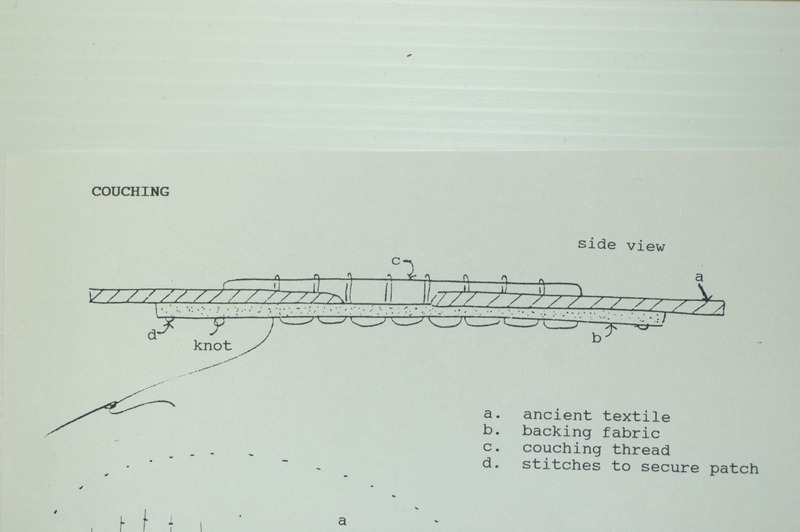 Couching holds the two fabrics together without obscuring the artifact, or putting much strain on the aged threads; darning or “invisible mending” (darning with threads unraveled from the damaged cloth) are far too invasive. 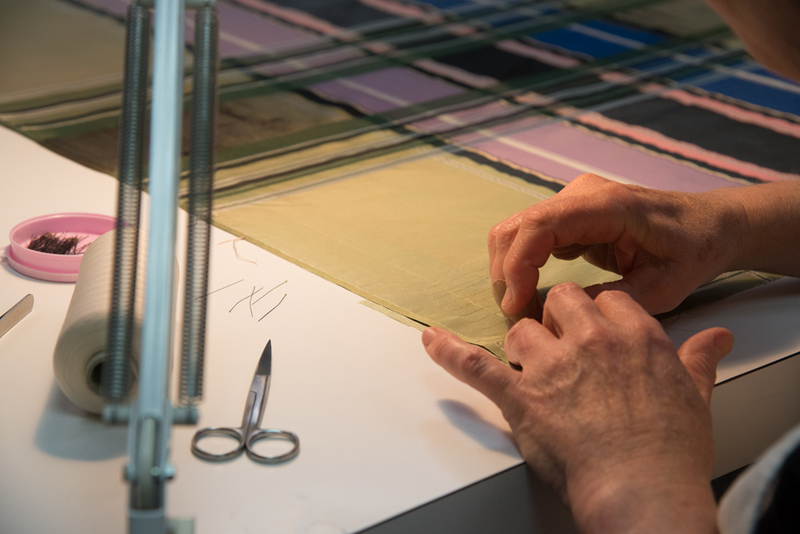 With the patching fabric behind, a long thread is laid on the face of the artifact perpendicular to the damage, but aligned with either the warp or weft threads. Then tiny stitches are made over the laid thread to hold it in place. Should the repair be removed in the future (because the patch has faded and no longer matches the artifact or because the patch is obscuring some information on the back of the textile or a hole is now believed to be more interesting than the appearance of completeness) the stitches holding the laid thread can be snipped at the back, the scissors only approaching the patch, not the artifact, and the laid thread lifted off the front. A dress from 1855-60 is being prepared for inclusion in the Gold Rush exhibit. This was a period in women’s fashions when skirts were extremely full with yards of fabric displayed over cage crinolines. This dress was worn as a costume for many, many years and the brilliantly coloured plaid silk is in very poor condition. There are many miles of couching thread to be laid before the dress will be ready for exhibit – if it wasn’t so exciting, it would be enough to turn a conservator into a vegetable.